For spiderveins that are a cosmetic problem on your legs. Sclerotherapy is the injection of a sclerosing liquid into the vein, that causes the vein walls to become "sticky". The vein walls will stick together, blood will stop flowing through the treated vein, a thin fibrous cord is formed and your body will naturally absorb the vein. Sclerotherapy is one of the oldest methods of treating varicose and spiderveins. Modern sclerotherapy is well suited to treat spider veins and small reticular veins below the level of your heart. Treating larger varicose veins requires the sclerosant to be delivered by catheter under ultrasound guidance and remains less effective than vein ablation procedures These larger varicose veins are best treated by endovenous radio frequency ablation. 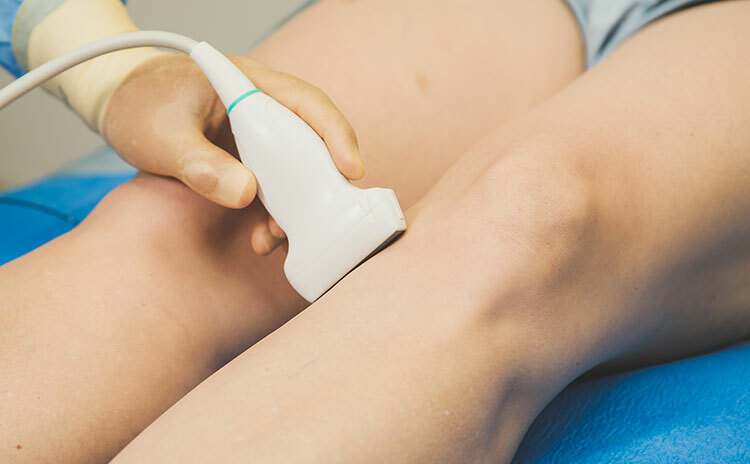 Surface Laser treatment of spider veins often fails in the lower leg and ankle area, these patients are well suited to sclerotherapy, and usually have excellent results. Sclerotherapy is an office based procedure and takes 10-30 minutes to complete. You need to wear a compression bandage or stocking afterwards for a few days. What to expect during a sclerotherapy session? Sclerotherapy or spider vein treatment is an office based procedure and takes 10 - 30 minutes to complete. While lying on an examination table, the treatment area of your legs will be cleansed with an antiseptic solution. The needles that are used for reticular and spider vein removal are very small, infact the smallest availible needle. 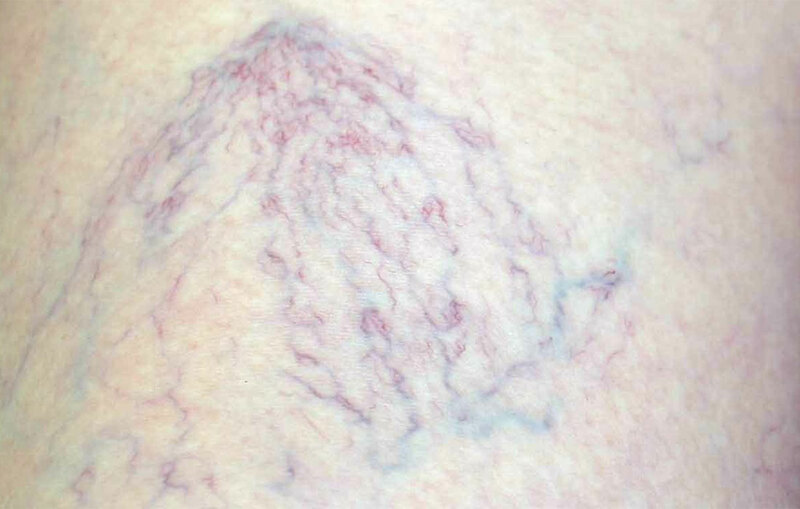 A special skin illuminating device is used to iluminate the skin from beneath, allowing the sclerotherapist to locate even the tiniest veins as well as hard-to-find deeper reticular veins that serve as feeder veins for superficial thread or spider veins. The technique is known as transilluminated Sclerotherapy because the device transilluminates the skin making it translucent. The effective treatment of feeder veins is important for complete eradication of your spider veins. 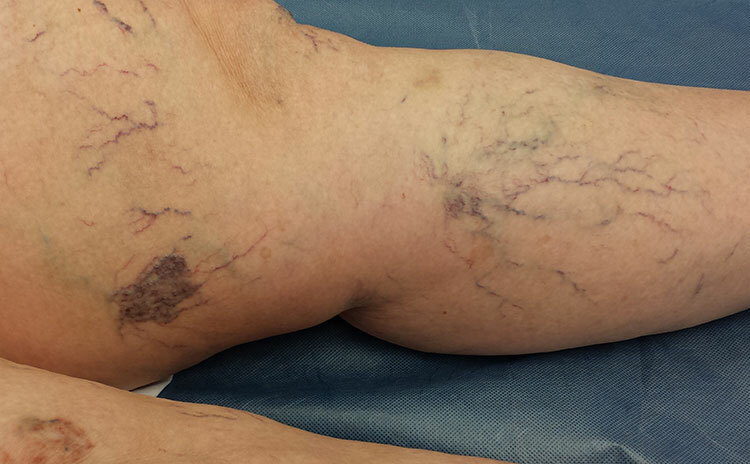 It is these feeder veins that are not treated by surface lasers, leading to undesired results. Bring short pants to wear during your treatment and loose fitting long pants or a skirt for afterwards. Preparation and Recovery after sclerotherapy? In the week before sclerotherapy, avoid taking medication that will "thin" your blood, like anti-inflammatories, arnica, aspirin. Avoid all tanning. Shaving or waxing your legs is a good idea, but do it at least a day or two in advance. On the day of your appointment, bring short pants to wear during treatment and long loose fitting clothing for after treatment. Afterwards avoid heavy lifting, strenuous exercise and hot baths for 2 days. Daily walking is very good and you are encouraged to walk at least 45 minutes every day for a couple of weeks. Compression therapy in the form of class 2 stockings will be provided afterwards and will improve results. Foam sclerotherapy is a mix of the sclerosant chemical and air, to produce a foam, that is injected. This is suitable for the treatment of buldging varicose veins or large veins. Cosmetic sclerotherapy is a liquid based sclerosant solution that is injected into fine reticular and spider veins. What are the risks and is it safe? Brown pigmentation happens in 5-30% of patients, most will resolve spontaneously over time, although it may sometimes take several months or longer to disappear. Light based treatments like IPL sometimes help expedite the process. Matting or neovascularization is a common side effect in patients treated by non-specialists. Matting refers to the formation of many new micro-fine spider veins that are very difficult to treat. Matting occurs in patients with undiagnosed underlying venous reflux and these patients will require a radio frequency ablation procedure first to treat their venous reflux prior to treatment of the spider veins. Sclerotherapy is performed by registered nurse sclerotherapists trained by Dr Blignaut. Sclerotherapy by Dr Blignaut - pricing available on request. Cosmetic Sclerotherapy for spider veins is not covered by medical schemes in South Africa.